fee-charging private, grammar or public schools). 1906 Sadler’s report is accepted. Derbyshire County Council commits itself to establishing a new Higher Elementary School in Long Eaton. Land which has been bought by local donation for such an eventuality will be used and shared with a new Carnegie Library (fund-raising committee Hon Sec – Samuel Clegg!) The site (then known as the ‘Gorse Holmes’) is to become the centre of a new ‘Cultural Democracy’ in Long Eaton. The local Cooperative Movement is instrumental in all of this. These values of education, culture and democracy are immortalised in the magnificent stained glass window in the County Library. 1912 First ‘School Annual’ is published, a mixture of reports, reviews, poetry and illustration; thereafter published annually (until the 1920s). 1913 The School is redesignated – Long Eaton County Secondary School (LECSS). A certain Mr F.L.Attenborough is appointed to the staff (he was a former pupil teacher at Clegg’s Pupil Teachers’ Centre elsewhere in the town before the school was built); he later marries Clegg’s daughter, Mary, becoming father of (Sir) David and (Lord) Richard Attenborough – the famous brothers are the grandchildren of Samuel Clegg. (There is a third grandson, John). Clegg’s son (Sir) Alec is to become the nationally renowned Chief Education Officer for the East Riding of Yorkshire. 1916 School Dinners are introduced at Long Eaton (4 old pence each, about 2p today). Most vegetables are actually grown on site! The kitchen is what is to become room 15, the Dining Hall room 14. 1918 School Leaving Age is raised from twelve to fourteen. End of the Great War. 1919 Increasing pupil numbers necessitate construction of “temporary” prefabricated hut accommodation – “temporarily” in use until finally demolished in the 1960s! 1926 Hadow Report – proposes separate schools for infants and juniors and an exam (later to become known as the 11+) to determine what type of secondary education would suit pupils best. 1930 Sudden death of Samuel Clegg (who was working in school only two days before). The end of an era for education in Long Eaton. Clegg is replaced by Mr F.E.Roberts (chosen from a field of 141 applicants!). The schoolchildren give him the (affectionate?) nickname of “Drac” – supposedly because of his appearance, always in a black academic gown). Additions are begun to the School building (the roof is removed from both ‘wings’ of the building, new first floor rooms built and the roof replaced – the ‘joins’ are still visible). These new rooms (rooms 11,12,13,18,19,20) include what will become the School Library and the second Art room. 1931 F E Roberts introduces Prefects (which had always been resisted by Clegg). 1934 First issue of “The Gossamer” school magazine ( the title is supposedly derived from the old name of the school site – “Gorse Holmes”). 1939 Start of World War Two. 1944 Education Act, finally implements Hadow Report of 1926 – free secondary education for all pupils in either Grammar Schools, Secondary Technical or Secondary Modern Schools, selected by examination at 11+. 1945 Long Eaton County Secondary School becomes The Long Eaton Grammar School. 1949-50 Old canteen upstairs converted into rooms 13 and 14 by addition of folding screen. These rooms were used by the film society and the old kitchen used as the projection room. A new canteen is built (adjacent to Tamworth Road – this later became the front car park). 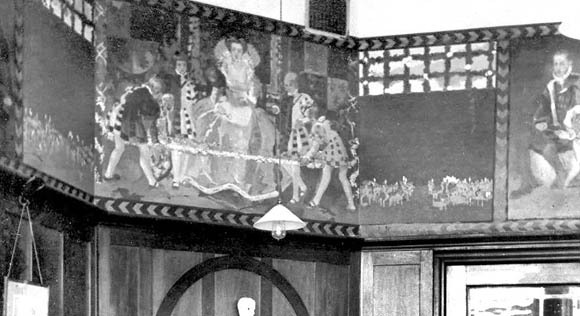 At about this time (*2) Murals in ground floor classrooms ‘Chaucer Room’, ‘Tudor Room’ & ‘Milton Room’ (painted under Clegg’s supervision in the 1920’s) are painted over as was the majority of the oak paneling. 1951 GCE O & A Level examinations are introduced. 1955-6 Most of the original dark stained wood paneling in rooms and corridors is painted over – in dull grey! 1957 Headteacher F E Roberts retires, replaced by Mr G.D.B.Gray. 1958 A new Science Block is built on what have been the school playing fields (ground & first floor only - a second floor is added ten years later). 1964 A new Secondary Modern School is built on land south of the Grammar School & west of the Erewash Canal – named Roper School after local Councilor Roper. 1968 The Canteen demolished,The Craft Block built (later Technology and Art); also new administration Block (with new Head’s office – and separate staff rooms for male & female teachers! ), a new school hall and sports hall. 1972-3 Amalgamation of Long Eaton Grammar School with Roper School to create a new Comprehensive School – named Long Eaton School. 1974 Gray retires; replaced by G.W.R. (‘Denny’) Davies. 1978 A new purpose-built vocational education block is built near the canal on what is left of the old school playing fields - this later becomes the Sixth Form block. 1989 School renamed - Long Eaton Community School. 2005 On the 3rd and 4th December the School hosts 'The Last Detention School Dinner'. A last chance for previous scholars to visit the old school building before it is developed. 2006 Tuesday February 14th is the last day that pupils were taught in the Tamworth Road site of the school. The old grade 2 listed building is retained and sold to a developer and the rest of the school is demolished. Pupils are now taught at a brand new school building adjacent to the old Roper School and is accessed from Thoresby Road and also via a new footbridge over the canal, from Tamworth Road. The Roper school is demolished and all the post 1968 buildings including the Science Block. 2008 Head Teacher Mr Vasey leaves to become Head at a school in Sutton in Ashfileld. Mr Neil Calvert takes over in September. *1. (original text corrected) 1919 - Increasing pupil numbers necessitate construction of "temporary" prefabricated hut accommodation - "temporarily" in use until finally demolished in .1999! Says Phil Payne: If those were the original huts there's a picture of them being demolished in 1968. The 1999 demolitions were the maths huts - don't know when they were built. I was told the far hut became the "music hut" because the dryness of the rest of the school would have wrecked the piano. *2. Says David Driver: I notice that Mr Eley thinks that the murals were painted over in the early 40's - this is incorrect. The School was completely redecorated when the Canteen was built - at the same time the paneling was desecrated with a coating of grey paint. and the place was rewired and the beautiful light fittings in the Hall (all Art Nouveau and hammered bronze) were ripped out. Later, the ceiling was leveled off because water had got into the original barreled lath and plaster and lumps of plaster began to fall off! *4. Old wooden huts (A and B) demolished - in 1967? Photo from David Wardel's Collection. 1919 - Increasing pupil numbers necessitate construction of temporary prefabricated hut accommodation - temporarily in use until finally demolished in the 1960s! 1930 - Additions are begun to the School building (the roof is removed from both wings of the building, new first floor rooms built and the roof replaced - the joins are still visible). These new rooms (rooms 11,12,13,18,19,20) include what will become the School Library and the second Art room. 1939? - 5 or 6 Air Raid Shelters contructed alongside the canal bank on the school playing field. 1946 - Two more huts are added to the temporary accommodation. 1949 - A new canteen is built (adjacent to Tamworth Road - this later became the front car park). 1952 - Hut C added (temporary accommodation) It was suppose to be ready for August but was completed a term late. 1954 - Conversion of the greenhouse into lavatories for the girls. 1958 - An new Science Block is built on what have been the school playing fields (ground & first floor only - a second floor is added ten years later). 1964 - A new Secondary Modern School is built on land south of the Grammar School and west of the Erewash Canal - this is named the Roper School after local Councilor Roper. 1978 - A new purpose-built vocational education block is built near the canal on what is left of the old school playing fields - this later becomes the Sixth Form block. 2002 - IT Building - a single-storey, two-room affair at the rear of the Technology block. It was equipped for, and exclusively used for, IT courses. 2006 - Everything is knocked down when Long Eaton School moves to its new building near Thoresby Road - except the original 1909/10 listed building! Widdows (1871-1946) was Derbyshire County Surveyor, later County Architect, from 1905 until his retirement in 1936. He was something of a revolutionary, an apostle for plenty of natural daylight and fresh air, in contrast to Victorian school buildings which, influenced by religious architecture, tended to have small narrow windows. He became one of the best-known school architects in the country and an article in The Builder in 1913 stated: The great work which Mr Widdows has carried out constitutes a revolution in the planning and arrangement of school buildings. In a lecture in 1910 (the year our building opened) to a Royal Sanitary Institute meeting Widdows did not mince his words, either about the government educational authority or about his own profession. To look at schools erected and added to with sanction of the Board of Education one wonders whether the Board did really regard fresh air as an invention of the devil... and ... There are very few architects who understand ventilation, or who try to understand it. A characteristic feature of a Widdows building, seen in your centre, are the ventilation hoppers at the bottom of each window which can be opened to admit air without causing draughts. Another is that the doors at the end of each corridor which lead to the outside are protected by a porch to prevent rain getting in. But most of all is the overall design, with those projecting angles, to maximise light and air to every part of the building. Pre-Widdows the tendency was for buildings to be simple rectangles, in his words, barrack or barn-like, which resulted in many rooms being stuffy and ill-lit. Widdows' buildings quickly gained a reputation for being healthy places to work in, and this was confirmed by the Long Eaton school's first headmaster, Samuel Clegg, who was present at his 1910 lecture, and is reported as having contributed to the discussion. Mr S. Clegg (Long Eaton) said that in his school the two great factors of all healthy environments -light and air - were abundantly present. No teacher had been absent for a single day through illness, nor had there been any case of sore throat in the schools since they were opened. Not the least important characteristic of the schools was cheerfulness, and this mental tonic conduced to physical well-being. What he thought was a most important advance made by Mr Widdows was his provision, by paneling, of wall-surfaces pleasing and restful, which lent themselves to tasteful and simple decoration, in the place of the wretched litter of scrappy wall-coverings, pictures, advertisements, and worse things too often found in schools. Above information received from Peter Clegg (Grandson of Samuel) via Geoffrey Kingscott. Many regard the Buildings to be Victorian. This is what Geoffrey Kingscott says: It was planned in the Edwardian era, and by the time it was formally opened in October 1910 George V was actually on the throne. It is essentially a 20th century building, and designed as a deliberate reaction against Victorian styles. Q. What do the form numbers L, M and R stand for? A. We were talking about the changes which took place in 1946 or thereabouts when the classes were changed from ABC to LMR. We all knew that the 'A's were the bright ones, 'B's were middling and 'C's were at the bottom. At some stage they changed back to ABC. (mid 50s?). There was also a G form in 1950 as denoted on one of the class photos.